Interchangeable blade fin very light and reactive with performances suitable for both beginners and more demanding freedivers. Due to its unique characteristics, this model is also appreciated by professionals and instructors for diving with Ara. Standard shovel / side member interface: screws under the liner + side clips. Extremely thin and light-weight shovel with an excellent propulsive performance. Full Contact certified thermoplastic rubber shoe. Longherone made of technopolymers with high modulus of flexion elastomeric fillers. Shovel in elastomeric technopolymer compounds developed by Cressi. Thanks to its specific and exclusive design, the propulsive performance, during the leg pass, is increased by an excellent return of the blade. 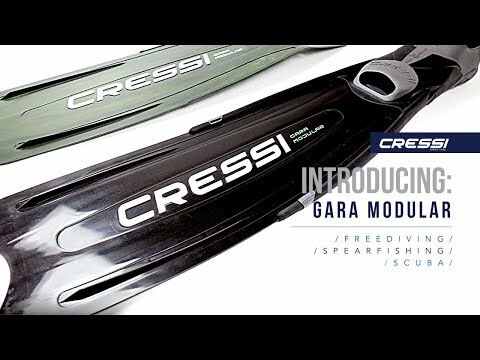 The blade of the Gara Modular has an incredible resistance to any type of impact, impact or stress, making it almost impossible to break accidental. New Self Adjusting liner molded in 2 materials: soft rubber in the fit and lasts in the side members and in the traction zones. Equipped with a central cut in the semi-rigid band to increase its wearability, specifically designed to allow every shoe to wear even very thick shoes. Bag for long fins, specially designed to contain mask and snorkel. Ideal for those who practice snorkeling or freediving.